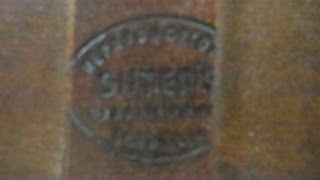 Below is a photo of the brand for the mirror displaying the company name. Overall this mirror is in good shape. 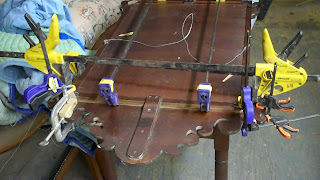 the upper left corner had a piece of scroll work that was broken off and the top was loose, so I made the repairs to the mirror as seen in the photo below. 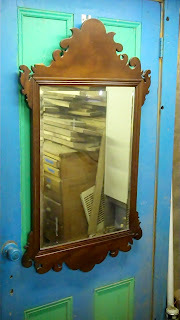 I will post a photo of the mirror once the repairs are touched up. 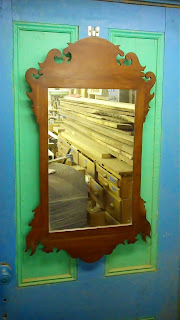 The second Chippendale Mirror had no maker attached to it but was made of Cherry, so it was probably an American piece. Below is a photo of this mirror. The only damage to this mirror was a small section of the scroll work which had broken off. 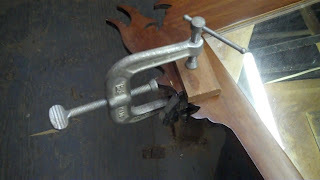 Below is a photo of the repair using a special three way clamp. 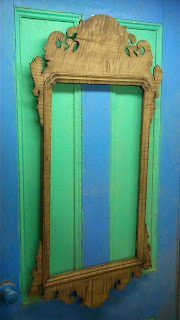 Again I will be posting a completed photo of the mirror once it is done. 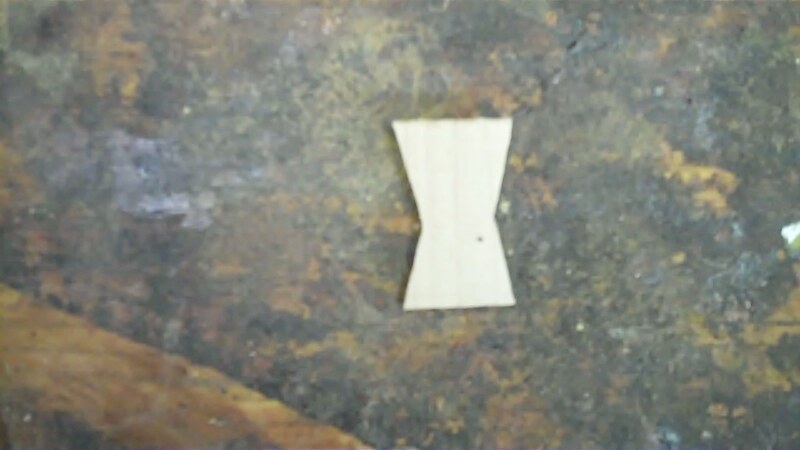 The third mirror is the oldest and has received the most work. 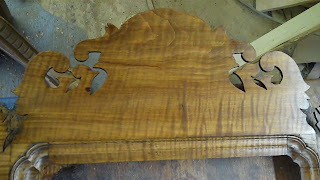 It is a Chippendale Mirror made from Tiger Stripe Maple. 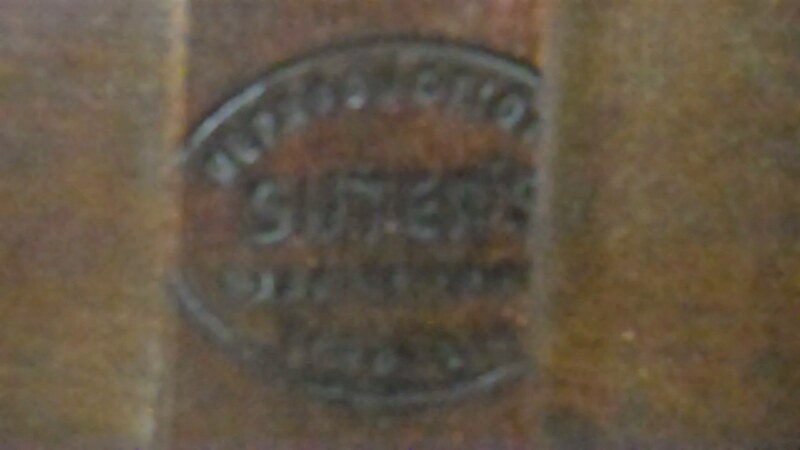 It is also the oldest and probably dates to the 1930's. 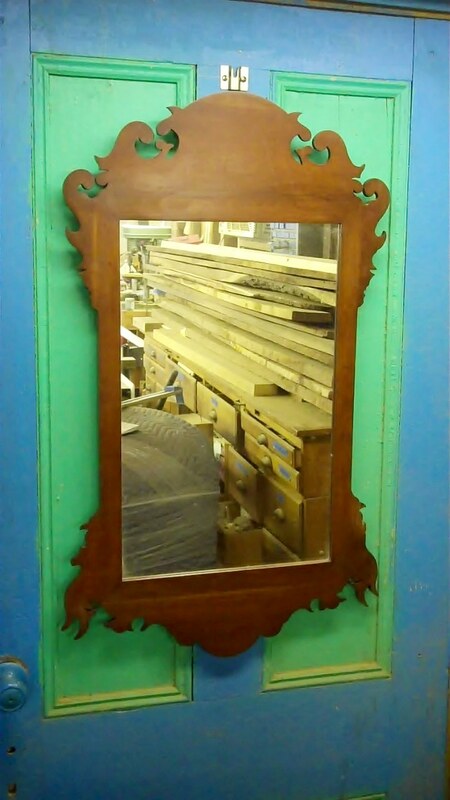 As was the trend of the times, the manufacturer wanted tins mirror to have an old look and to achieve this stained the entire mirror with a muddy brown stain in the finish that pretty much hid the beautiful grain of the wood below. 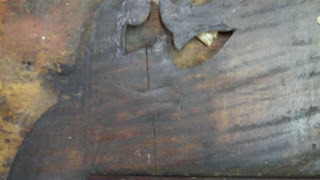 The customer and I decided to remove this finish and expose the wood beneath. 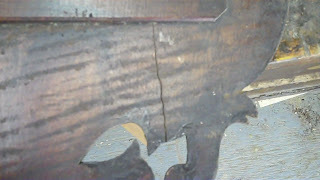 The mirror frame also had a crack in the top of the scroll work that required a butterfly patch. 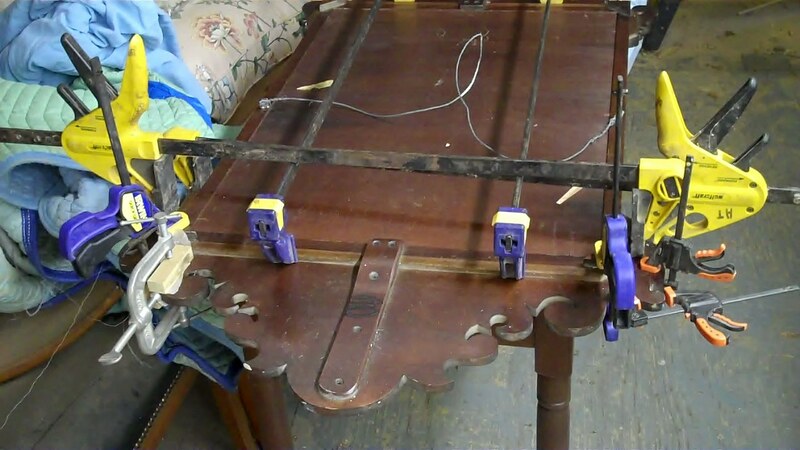 The photos below detail the restoration of this mirror. 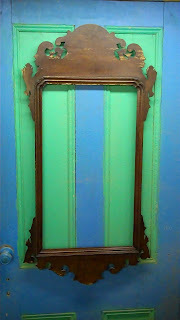 The first photo is of the mirror as it came to me. I have removed the glass to protect it while the work was being done. Below is a photo of the finish being removed. 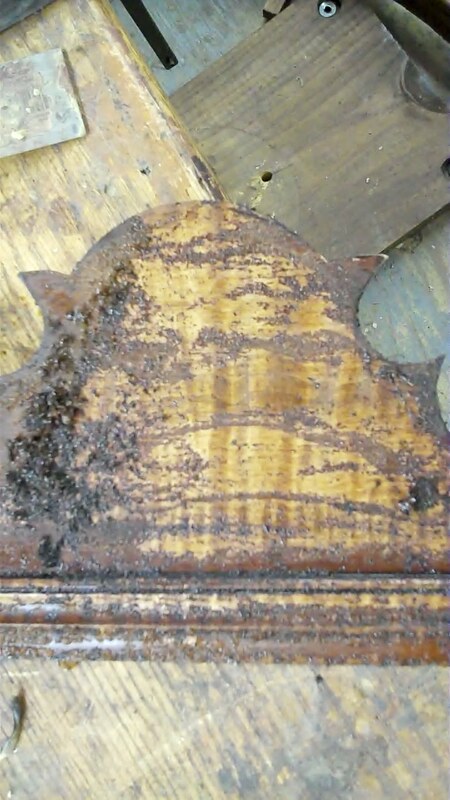 It was great to see this beautiful wood come out from behind the brown stain! Here is a photo of the frame with the finish removed. This is a photo of the crack in the scroll work as seen from the back of the frame. I cut a small butterfly patch out of tiger Stripe maple to bridge the crack. here is the patch. 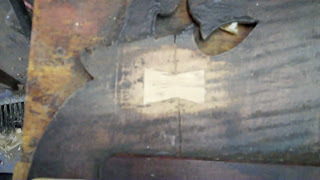 The patch was scribed with an Xacto blade and the area was cut out to receive the patch. The patch was then glued in place. 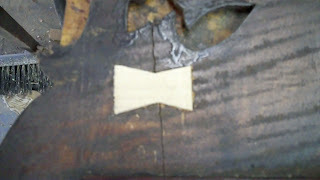 Here is the patch after it was glued in place. 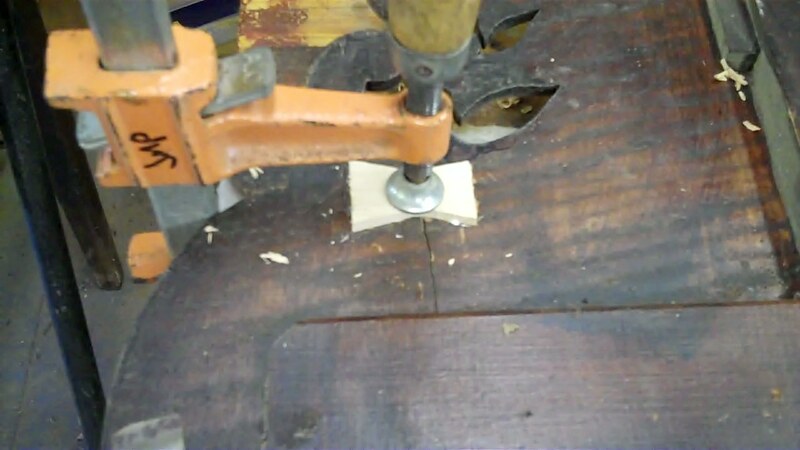 you can see how the narrowest part of the patch is lined up with the crack. Not only does this stabilize the crack, but it also keeps the wood from expanding and contracting. The next step was to pare down the patch until it was flush with the rest of the wood.It was then lightly sanded. Here is the patch after it has been touched-up. 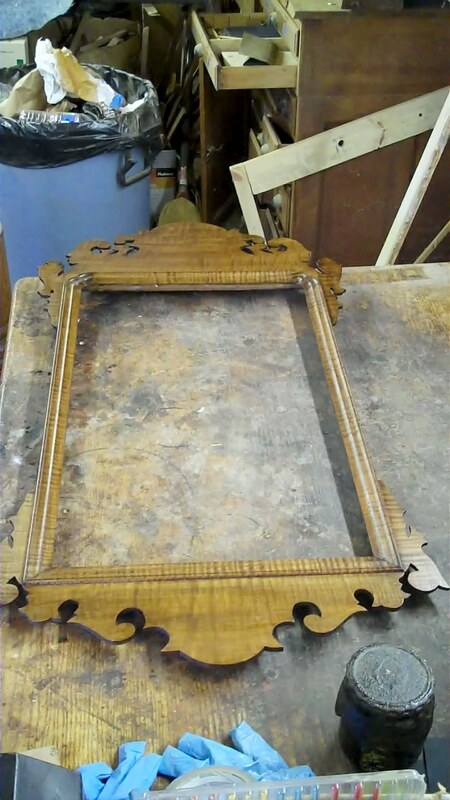 this photo shows the frame in the finishing process. Here is a close up of the top showing the beauty of the Tiger Stripe Maple. Once this is complete I will post some more photos. 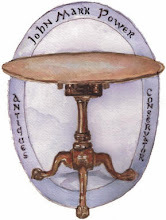 Beautiful work and wonderful site. 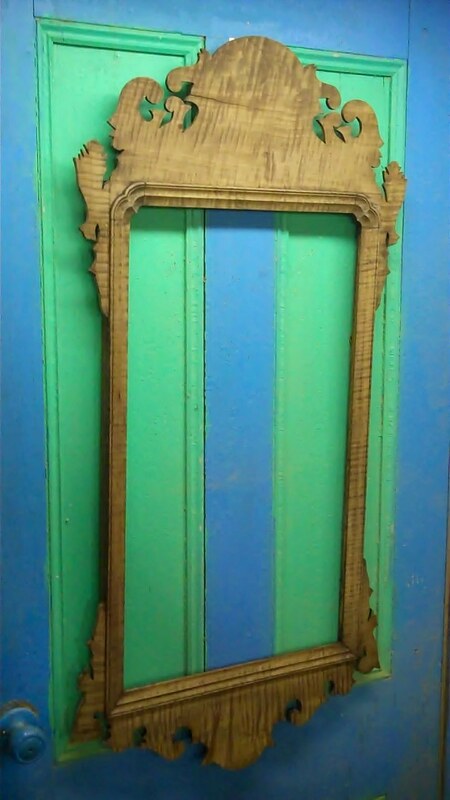 an 18 century Chippendale mirror (25" x 15")?